We received some lovely feedback from Stephen’s family and wanted to share it with you. “Stephen would like to thank you for arranging this trip to London for him, so would Sue & Dean. 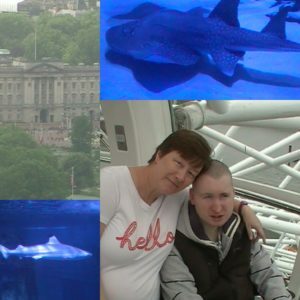 He was up early for the trip so we had Lunch at Bill’s as soon as we got there then walked to the London Aquarium which Stephen enjoyed as he saw some famous parts of London. Stephen enjoyed the Aquarium and spent a lot of time by the sharks. We all had a lovely stay at the Ibis Hotel and Stephen was up early for the trip on the London Eye.